Milnor's Pass-Through Dryers can be used as free-standing dryers to match up with large washer-extractors as well as tunnel washer systems. Many patented and unique features make these dryers highly productive and efficient. Fast drying results from strong airflow and high heat input. Milnor's lint filter system eliminates the need to manually clean the dryer's lint filter. This system strips the dryer's internal lint filter clean after each dry cycle. Microprocessor control allows field-programming for dry formulas. Dryer controls can also be linked to a Mildata computer system for central programming, system monitoring, and production reporting. Milnor Pass-Through Dryers are built from quality and durable materials and painted with a powder-coat for thorough protection. This places the heaviest goods, which are generally the wettest, nearest the heat entry and also offers faster dry times and easier unloading. Our mirror-mount design feature allows two 64058 dryers to install side-by-side. The motors and controls can mount on either side of the unit, optimizing floor space. Milnor maintains proper air flow by keeping the hot air flowing through the laundry without letting it escape around the outside of the basket. 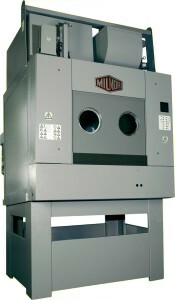 Click here for more information on Milnor Pass-Through Dryers.